Where does Sultan Shaykh Mehmet Adil QS fit into the Osmanli Tariqa? Thank you for the question and I am taking this opportunity to answer to all those who are affiliated to the Tariqah! But all shaykhs are honored in all silsila and they may only mention the main teachers of their Silsila. For example: Hazret Abu Yazid Al Bistami and Hazret Imam Rabbani Ahmed Sirhindi (May Allah be well pleased with them both) are the some of the greatest Imams of this silsila and in all the Naqshbandi Silsilas (Chains) , but does anyone mention their names today?. Let’s say another thing, Sayyidina Abu Bakar Siddiq (R.A) is the highest Imam of the Naqshbandi Silsila, but why no one ever mention his name in the recitation of dedication (Ihda) , Imam Jafar Sadiq (A.S) also there in the Silsila , but no one mention his name there!. So why the murids are busy with this confusion? When an Osmanli Naksibendi follower recite: ‘wa ila mashaikhina fi tariqati Naqshbandiyatil aaliya, then all shaykhs of this tariqah fit into this calling. If it is not fitting there, then it fit into ‘wa ilaa saa’iri sadaathina wa siddiqin ‘ it is here all grand shaykhs and all shaykhs from all tariqah fit in to this calling. This is how the corruption gone through in Tariqah just as it went through among the children of Israel, among Christians, after Nabi Muhammad alaihiswalathu wa salam, it happened among the Arabs, some of them became Kharij, some became apostates, some became Shia! So first of all, why is this Tariqah for?. Why I am a part of Tariqah?, if this questions are addressed to it’s right meaning and accept its correct purpose in one’s life ,then there is not going to be any confusion!. A so called Khalifa of Mawlana, who was a representative of Shaykh Dagestani (Q.S) too, who attacked Shaykh Abdul Kerim 9 years ago, he followed his own ego, he made Takfir on Shaykh Abdul Kerim and his followers saying: “Shaykh abdul Kerim and his followers are going to Hell” (Na’uzubullahi). So if someone who was a Murid and Khalifa of two grand Shaykhs can follow his ego and speak obscene and forbidden things by following his false pride, then who are this baby Khalifas and Baby Shaykhs and baby representatives?. Do you really think that they are free from following ego? Similar way, some people came out from Osmanli Naksibendi Way, and started attacking me, because this people who are there to cause fasaad (corruption) , they do it with some people, because they cannot sit back. When it was in the time of Shaykh Abdul Kerim , they came out and it was between them Shaykh Hisham’s followers and it grew up and cause great distress. After that, I was their target for some time. And Allah Almighty showed me whenever they rise up against me. One of them, who claimed and known among Shaykh Abdul Kerim’s follower, as “a close ally”, he declared I am a Yahudi, because I worn a black Fes on my head, later I forgave him and messaged him and showed him kindness, but his heart could not accept it, though he was the one who making takfir! Many followers of Shaykh Abdul Kerim, who had known to me personally in the early years of my baya into tariqah, they eventually departed from me, (alhamdulillah for good reason). I have always respected and love all fellow Muslims, not just Murids of this Tariqah, and I am kind to all human beings! As I always recite: “Ya Qawiyyu Ya Matheen Ikfi Sharra Zaalimeen”, it is obligatory upon those who have malice against me to leave me! So if you are “Truth” you will remain with me, if you are for false (Batil) you will depart from me, this is a promise from Allah Almighty , I have received in one night in 2004 and Allah’s Words Will not Change!, Only what is Truth and bearers of Truth will remain with me!. Recently I heard, they came against a weak follower of the tariqah who is from South of England and they caused a great distress to him. The so called Murids who live 24 hours with Shaykh, but not knowing the mental condition of a lover of their Shaykh who live 1000s of miles far from him, and argue with him over internet!. Does Shaykh Abdul Kerim permit this?. This is why I said, 21st century dergahs and masjids are filled with evil and Mahdi alaihissalam coming to purify the Places of Worship! So let’s come back to the point, I am not a Jew, I do not take some and reject some other (Quran 2:85) . My Shaykh Sahibul Saif Hazret Shaykh Abdul Kerim Al Kibrisi (Q.S) insisted me not to take nothing from anyone else, except from Mawlana Shaykh Nazim Al Haqqani (Q.S). 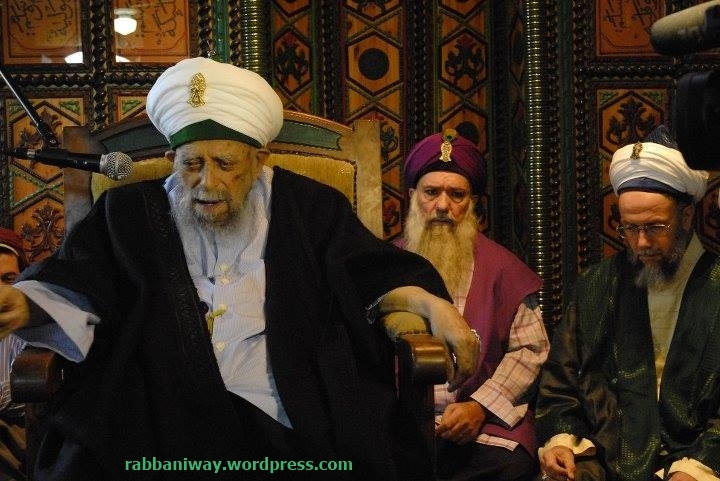 I accept what Mawlana Shaykh says with full submission. Mawlana Shaykh says, Be straight, Isthiqamat, I accept and I am not taking what is croocked ideologies, or doctrines, whether it is coming from another Shaykh or Khalifa. Mawlana Shaykh proclaimed his son Shaykh Muhammad to be his Khalifa, I accept that, Mawlana Shaykh said to continue the “Osmanli Naqshbandi Haqqani Way” as a distinct Jamah, I accept it . I do not know about others and what they are told. That’s not my business. In a Tariqah, a Shaykh can be genuine person and on straight path, but the Jamah can be messed up and dirty, because everyone bringing their ego into the Jamath. So the Jamah (Al Jamah) of the Quran and Hadith is to be with “Prophets,Siddiqin and Saliheen” (4:69)bring evil to the tariqah, not to be busy with those who bring misguidance and error. So even if you are alone in the Way of your Shaykh, if your heart and intention is clean, then you will be in the company of Prophets ,Siddiqin and Saliheen. But when you follow the intentions , whims and mischievous opinions of this so called Murids, you get slowly corrupted., does not matter whether you are a Qutub Al Mutasarif or Gawth al Aalam. You will loose the track and you will be out over the time. Thats what happened to some Qutubs and Gawsth of this times! So we ask Allah Subhana Wa Ta’ala to bless us Isthiqamath, and heavenly aid (17:80) and and a distinction from falsehood (17:81) and heavenly guidance (3:18). Be busy with Allah and Nabi Muhammad alaihiswalathu wa salam. This are my views for past five years, what is inspired into my heart. And if anyone think, Jouharali betrayed his Shaykh/his Efendi, then let them think as they like. That kind of tactics will not work in front of me. I have been blessed to see my Shaykh and my Prophet (alaihiswalathu wa salam), if they are not displeased with me, then it does not matter to me, if the whole world is pleased or displeased with me. In the earlier days, some followers of Imam Malik (R.A) attacked Imam Shafi (R.A), so if the ego was working on that day of the salaf , it is working today, and making it’s own interpretations, accepting some from the religion and rejecting other (see Quran 2:85). The division in this Ummah came, just as it came among Christians and Jews. I have showed him those cards I printed for Osmanli Naqshbandi Haqqani Sufi Way, he hasn’t rejected or declined this . Because who can reject the Will of Mawlana?. Whatever happened after Nabi Muhammad alaihiswalathu wa salam to the generation of Sahaba, the same thigs happened and his happening after Mawlana Shaykh. Those who have eye, let them look and see. And those who can see let them understand.